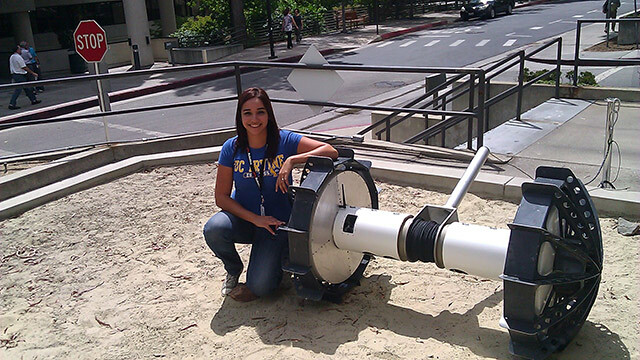 On my second “first day” as an intern at the Jet Propulsion Laboratory, I felt a very different kind of nervousness from my first internship, last summer. I still had butterflies, and I didn’t know what my team would be like, but I also felt very comfortable with what I was about to encounter — even the long daily commute from Orange County. As I sat through student orientation, I once again found myself thinking about how I got here, and I’m still in disbelief! Two years ago, I was sitting in my algebra class at Santa Ana College, a digital arts major, when I learned about my school’s Bridge to Engineering Program (B2E). The rapid evolution of computers and the amazing things that technology makes possible have always astounded me. I love art, but I decided I wanted to use my artistic abilities to create something that was useful and innovative, as well as attractive. Through the B2E program, I saw the opportunity to choose a major that I originally thought would be too difficult to take on as a returning student (who had been away from school for over 10 years) a wife, and mother of two. So I changed my major to software engineering. B2E provides a lot of support that will allow me to fulfill the math courses I require to transfer to a four-year-university as a software engineering major. And it was through B2E that I learned about the opportunity to apply for a robotics internship with JPL’s Minority Student Programs in 2013 — even though I was only starting my freshman year as a software engineering major. Last summer, my assignment was to help test an extreme-terrain rover prototype called Axel. With my team and my mentor, Issa Nesnas, I developed test plans for the rover; I designed and constructed dust barriers for its three on-board cameras (the cone-shaped barrier alleviated potential glitches with video transmissions); and, I helped conduct remote tests of the rover, driving it “blindly” (using only the rover’s images and telemetry to direct it) down the hills above JPL. Driving the Axel rover was one of the most exciting and at the same time nerve-wracking things I have ever done. Just imagine: You’re only a freshman, this is your first internship, and your mentor says to you, “Here, drive this rover, worth thousands of dollars, blindly down the slopes and through the trees. Just make sure you don’t break it.” Pretty awesome, right? I must have done OK, because my internship was extended. It was one of the most rewarding, exciting and exhausting things I have ever done. My experience at JPL was so incredible that without thinking about the long commute, I decided to apply again. And I feel very fortunate to be here two years in a row, just as excited as the first time, absorbing everything I possibly can from everyone I meet and everything I see. I’m in the robotics section again, this time working with quadrotors alongside my mentor, Roland Brockers. My teammates and I are producing materials for a research video and designing a graphical user interface (i.e., a way for humans to interact with a computer system) for micro air vehicle (MAV) control. My team’s dynamic this year is very different than the last. It’s a bigger group. All the guys are great. They are all very smart, and I’m learning a lot from them. What I’ve learned during both of my internships is that there is nothing like hands-on experience. Practice is crucial to learning programming; and, team work and a good group dynamic are vital to a project’s success. I still walk around JPL in awe, but it feels more and more familiar every day. I am still in junior college and most of the interns I’ve met are either seniors or recent graduates from prestigious four-year universities. Some might think it would be intimidating, but I feel lucky to be surrounded by such intelligent people — people who I can learn from. My experience as a summer intern here has only reinforced my desire to continue with my education and tackle any obstacles that the journey brings to one day have a job that I love — one that challenges me and teaches me something new every day. I am grateful for the opportunity to participate in this unforgettable experience and for the support I receive from my family to fulfill this incredible dream. It is amazing knowing that my sons associate everything space related to their mommy. I love that.